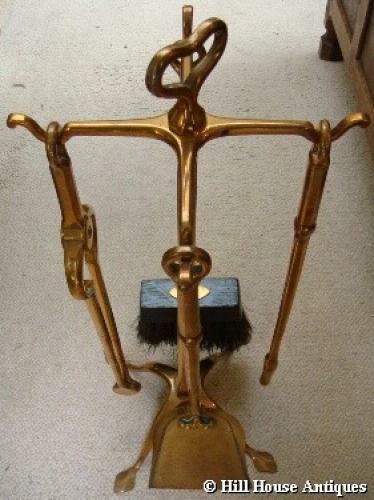 Rare Cotswold School set of copper/bronze Arts & Crafts fire tools on their original stand on stylised quadruped base, by Gordon Russell of Broadway, c1925; very much a reworking of earlier designs by Ernest Gimson. Comprising brush, poker, tongs, shovel and stand. A similar set was exhibited at The Fine Art Society 2002 exhibition “Pastoral” p60 exh 55. Another similar set is in the collection of the Cheltenham Museum & Art Gallery; see their publication, “Simplicity or Splendour......Objects from the Cheltenham Collections” p156, fig 184 Cat. 206, listed as being designed by Gordon Russell and made by Harry Gardiner c1924.